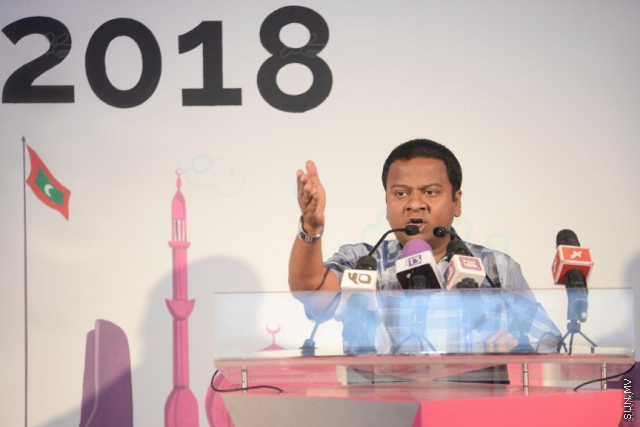 Maldivian Ambassador to Sri Lanka, Mohamed Hussain Shareef (Mundhu) has said that President Yameen will be elected for a second term in the Presidential Election in a landslide victory. Speaking in English at the PPM event at Rumaalu 2 campaign hall tonight, Mundhu said that he is determined to elect President Yameen for a second term. He said that his remarks are not of his own opinions but that of the youth of the country and those who wishes good for the nation. Mundhu said that President Yameen has been the most capable president in the Maldives in the past 50 years. He said that some people have been spreading false reports about the Maldives and invited international observers to visit the country. He said that there have been multiple attempts to overthrow the presidency of President Yameen since he got elected in 2013. Mundhu said that the oppositions are now attempting to overthrow the government before the end of the term.